·Mr. Kiss Kiss Bang Bang! James Bond: The Secret World of 007: "From its foreword, written by M16's very own chief, M, James Bond: the Secret World of 007 takes readers on a thrill-packed journey through the life and career of the world's most famous secret agent. Every major mission Bond has ever undertaken in the interests of world security, from Dr. No to The World Is Not Enough, is investigated and explained. Spectacular illustrations and photographs reveal, for the first time, the hidden workings of Bond's incredible vehicles and gadgets, the labyrinthine lairs, and masterplans of villains such as Ernst Stavro Blofeld, Elliot Carver, and Auric Goldfinger, and some of 007's most spectacular chases and battles. The book also explores Bond's lovelife, and his relationships with other key members of M16, such as M, Q, and Miss Moneypenny. In addition, a reference section gives details of the world famous movies based upon his amazing assignments. Officially endorsed by Eon Productions, creators of the Bond movies, this in-depth approach to Bond's career will bring 007 to life for fans of all ages." The Complete James Bond Movie Encyclopedia: "The Complete James Bond Movie Encyclopedia by Rubin offers its readers a cornucopia of trivial knowledge about arguably the world's most famous action hero. From more widely known facts, such as who the first man to play Bond was; to more obscure bits of information, such as the domestic and international grosses of all the Bond films; a true Bond fan is sure to spend hours delving into all the little quirks and idiosyncrasies that make agent 007 such an icon to so many." A reader's recommendation at Amazon.com. Licence to Thrill: "James Chapman expertly traces the annals of celluloid Bond from its inauguration with 1962's Dr. No through its progression beyond Ian Fleming's spy novels to the action-adventure spectaculars of GoldenEye and Tomorrow Never Dies. He argues that the enormous popularity of the series represents more than just the sum total of the films' box-office receipts and involves questions of film culture in a wider sense. 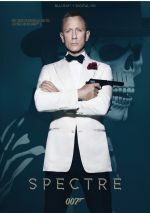 Licence to Thrill chronicles how Bond, a representative of a British Empire that no longer existed in his generation, became a symbol of his nation's might in a Cold War world where Britain was no longer a primary actor."